It's a simple dictum, but one that many still have trouble accepting: Israelis and Palestinians have to talk to each other if they're going to get anywhere. 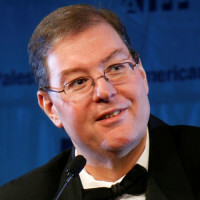 A flurry of condemnation greeted the tweeting by Ha'aretz reporter Natasha Mozgovaya of a photograph of Ziad Asali, President of the American Task Force on Palestine (ATFP), at a recent "Independence Day" event held by the Israeli Embassy. ATFP's critics' outrage proves that, from the right and the left they either fail or refuse to comprehend this dictum or the basic mission of the Task Force. ATFP was founded to advocate that it is in the American national interest to end the occupation and establish a Palestinian state alongside Israel in peace, security and dignity. It is not opposed to Israel, but it is opposed to the occupation. This is consistent with stated American, UN, Palestinian and Arab League policies. ATFP is an American organization and works within the political system to secure a goal that is in American interests, as well as those of the Palestinians and Israel. And in terms of gaining a real measure of influence in the policy conversation in Washington, it has been an unprecedented and unexpected success, especially by deftly advocating for Palestine with Israel as a partner, rather than a target. The basis of this success is that serious people on all sides talk to Asali. They know that other serious people also talk to him, frankly, seriously and respectfully. ATFP works to bring Palestinians and Americans closer together, and to maintain strong relations with Palestinian and American leaders and working relations with Israeli officials. This is the only approach that anyone based in the United States who seriously wants to achieve anything practical for peace, or to improve the lives of Palestinians, can actually take. Mozgovaya's photograph merely reconfirms what ATFP has always openly and frankly pursued: a public and strategic display of continued contact with the Israeli establishment to promote the goals of peace and ending the occupation. Those who think there is a military solution are welcome to pursue it. Others may hide their activities, or pander to a lowest common denominator, but ATFP has consistently and publicly maintained those relationships and contacts. This is hardly the first Israeli or Jewish-American event attended by ATFP officials, and it won't be the last. Israeli officials and pro-Israel Jewish-Americans have attended every ATFP annual gala, sitting alongside Palestinian activists and Arab diplomats in some of the most extraordinary Middle East policy gatherings to have ever taken place in Washington. Such meetings have always been based on mutual respect and dignity. Asali is a trailblazer and a visionary. His approach has been controversial, but driven by the watchwords of seriousness, credibility and integrity, he has not shied away from taking bold positions and making difficult choices precisely because they are necessary for progress. Asali's critics need to ask themselves what the Palestinians and their allies can possibly achieve without talking to, and ultimately making an agreement with, the Israelis. The status quo is clear: occupation. Asali's mission is to change that status quo. Ever since he became the President of the American-Arab Anti-Discrimination Committee in 2001, and then President of ATFP, which he founded in 2003, Asali has not drawn a single penny in salary or other compensation. This extraordinary, and in my experience unparalleled, commitment, led the late Edward Said to aptly describe him as a public-spirited physician who voluntarily gave up his medical practice to run the organization on a pro bono basis. That this has continued for no less than twelve years in the face of unrelenting, and often personal and vituperative, criticismâand without any prospect or expectation of personal gain tells you all you need to know about his character and integrity. Asali has led ATFP in reaching out not only to US officials and Arab-American organizations but also Jewish-American groups across the political spectrum. ATFP has angered many by refusing to become embroiled in political squabbles, particularly between rival Jewish-American organizations. Under Asali, it pursues its mission with scrupulous independence, and declines to serve as a prop in anyone else's dramas. Asali has proven that Palestinian-Americans can work within the system as first-class American citizens. Washington has paid attention. Secretaries of State Rice from the Bush administration and Clinton from the Obama administration have addressed ATFP galas, attended by a who's who of the Washington Middle East policy establishment. A 2009 letter from Rep. Howard L. Berman (D-CA), then Chairman of the House Committee on Foreign Affairs, attested that Asali and ATFP "have been an important influence on my own thinking about Middle East peacemaking and that of many of my colleagues in the Congress." Asali and ATFP have been instrumental in changing perceptions of the PA institution-building program.within the government and foreign policy establishment by persuasively arguing that is a strategic and political initiative, not just a development program. ATFP has been active and effective in helping to secure continued American aid to the PA following the UN membership bid last September. The Palestine Liberation Organization recognized Israel in 1993. Palestinian officials meet with Israeli officials on a regular basis. It makes no sense whatsoever for Palestinian-Americans to refuse to talk with Jewish-American groups, or with Israeli officials, they do not fully agree with. It is what we say that really counts, and ATFP expresses the same message, no matter the language, medium or interlocutor. By condemning Asali for such meetings, his critics are attacking someone who talks the talk and walks the walk. Such critics will be taken seriously only when they do the same. If they do not like ATFP, they should establish their own organizations, rather than tear down the Task Force, a disturbing phenomenon thoroughly excavated in Said's article cited above. They should be ashamed of their shallow, petty, and often vicious narrow-mindedness. And, most importantly, they need to accept this inescapable reality: we need to talk.